Top brands deliver what their customers want and need at different points before, during, and after a purchase. How do they do it? They’re not mind readers, and they haven’t got psychics on speed dial. This level of consistency in adding value at each interaction is the result of a strong understanding of customer personas and the customer journey. 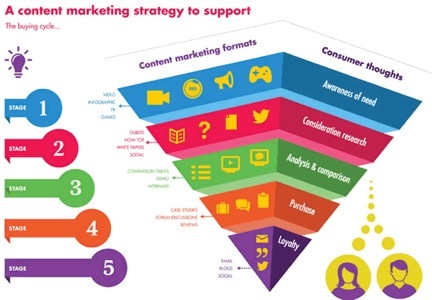 Yes, mapping that customer journey is a process for both B2B and B2C brands—in fact, it’s one of the biggest content marketing challenges for marketers—but knowing how to leverage content for different stages is the key to getting the most traction from your content initiatives and building relationships with your audience. Here’s what you need to know about developing content for each of the five stages of the customer journey. Below is a breakdown of the five stages of the customer journey and the types of content that best fit those molds. What it means for your customer: In awareness mode, your customers haven’t yet made purchases, but they may have joined an email list, engaged with your social pages, or taken other steps to familiarize themselves with your brand. What it means for your content: In short terms, your customers have shown they’re interested. It’s your job to create content that feeds the spark and continues to engage without leaning too hard on a sale (that could be off-putting). Consider sending a warm welcome email with plenty of calls to action or extending a special offer via social media. Make sure to offer multiple ways they can gather more information, like ebooks, white papers, etc. What it means for your customer: Customers in consideration mode are still researching and haven’t yet made a purchase. They’re more engaged than those potential buyers in the awareness stage, though, because they’re actively trying to learn more. What it means for your content: Customers in consideration mode want to learn what makes your brand different. They want to trust you—and not because you tell them to, but because you’ve demonstrated through content and thought leadership that you know your stuff. Have a relevant comparison white paper, a robust Q & A page, or a product highlight video that might be of service? Now is the time to offer it. The consideration stage is also a great time for coupons and offers, as long as you’re not over-dong it. What it means for your customer: In the decision phase, customers choose whether or not to purchase your product or service based on the information and insight they received in the first two stages of their journey. What it means for your content: Your content shouldn’t stop providing value after the purchase is made. Instead, use content to help ensure your buyer gets the most out of their new product or service. Offer up case studies, best practice guides, or how-to videos. What it means for your customer: After they’ve converted from prospects to buyers, consumers fall into the post-purchase stage. This is a make-or-break phase for your brand, as it can be the difference between having a loyal customer or a one-time purchaser. 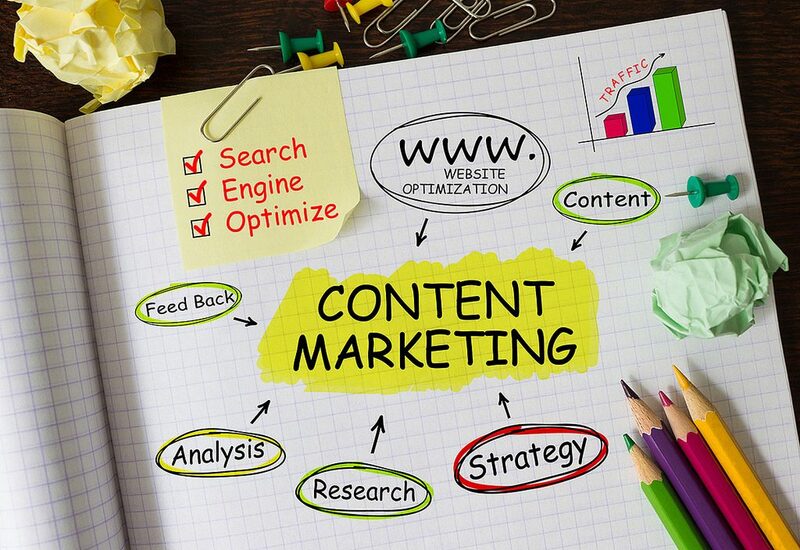 What it means for your content: The post-purchase stage is a great time for your brand to truly connect with your audience and keep them interested via a variety of content offerings. Consider sharing your brand’s story, curate thought leadership pieces for your industry into your newsletters, and stay active on social media platforms. If you become a resource in your marketplace, consumers will turn to your brand for information, expertise, and even future purchases. What it means for your customer: When your post-purchase stage efforts fall flat, customers can slip into dormancy. In this stage, your brand is no longer top-of-mind, and your emails may have made their way to the spam folder. What it means for your content: If your consumers have reached the dormancy stage, that means your old tactics are no longer working. This is a good time to examine buyers’ preferences and purchasing behaviors, noting how they’ve changed. Reword, restructure, or revitalize content so you’re offering new value, not more of the same—and an attention-grabbing promotional offer never hurt in this phase, either. Although the stages are named a bit differently, Figure 1 below offers a great visual to help you turn these concepts into practice. Marketers are smart. We know building a relationship with our customers before, during, and after the sale is the overall goal of marketing, and we know that offering value through content can help our brands get there. Sometimes it can be difficult to deliver the right content at the right moment, though, no matter how great our intentions are—and that’s where customer journey mapping acts as a compass. Where are you and your team on this front? Are you considering the customer journey when mapping out and creating content? If not, it’s time to start. And for those of you who have this nailed, have any tips to share for those still navigating the process? We’d love to hear your success stories.